It's been a long week. We drove up to visit my mother last weekend, and ended up calling the EMT's for her within an hour of our arrival. The details aren't important to this, but I unexpectedly found myself "elderproofing" much of her house over the course of the last week. As you may have noticed, I like to post little DIY projects here from time to time. This is going to be a strange one, so bare with me. You see, Mom has been dealing with Parkinson's for some time. It's a truly evil disease which slowly takes away your brain's ability to tell your body what to do. One of the symptoms can be freezing of gait (FOG). A person can be walking along, and suddenly "freeze." She'll find that she can't make her feet move forward for the next step. The brain simply refuses to send the command, even if it means you topple forward. There are treatments for the disease, but unfortunately, not all symptoms respond equally, and FOG is one of the harder ones. Mom's house is a 2-story split level ranch, so you need to traverse stairs to go just about from anywhere to anywhere. For some time, I've been asking Mom about possibly changing the layout of the house so she didn't need to traverse so many stairs, and even researched those motorized chairs. Her response was always "I'm fine on the stairs." I always had visions of her freezing on stairs, with catastrophic results. But she maintained that freezing was out of the question on the stairs. She has a walker at each level, to help with her get around, but other than a railing on each side, there are is no special equipment on the stairs. She'll park one at the base of the stairs, go up and take to the other one she'd previously parked at the top of the stairs, regularly traversing all four levels in the house many times a day (getting her to sit down is another issue). After watching her, I eventually had to admit that the Parkinson's seemed to give here a temporary reprieve every time she went up or down a set of stairs. I finally got a clue when visiting for the holidays. She had recently received a very fancy (and very expensive) walker. The most obvious difference between this and her other walkers was that it was equipped with laser module that projects a red line immediately behind it. The idea is to take advantage of a phenomenon known as visual cueing. Somehow, having some threshold or barrier to step over bypasses the freeze and frees up a FOG victim to take the next step. Directing a laser line to just in front of a persons toes provides an ever-moving target to step over with the next step. Watching Mom was fascinating, she'd be having problems moving forward, then I'd reach over and click on the laser and off she'd go. If I were a cruel person, I'd be tempted to put it on remote control so the kids could play a raucous game of "Grandma stops! Grandma goes! Grandma stops! Grandma goes!..." Unfortunately, the new walker isn't a panacea. Did I mention it's expensive? Getting one of these all four levels in the house would be a five figure proposition. Even worse, the brakes are "backward". It makes perfect sense to make the brakes on a walker only disengage when the user is actively squeezing handles, which is exactly what this walker does. The only problem is that all of Mom's other walkers have the opposite configuration, and so her muscle memory hasn't been trained for this. Also, the amount of force required to release the brake is too much for her. We've tried to loosen it, but the adjustable range doesn't go low enough. After seeing the amazing effect, I kept encouraging her to use it, but kept finding it parked in the corner for those reasons. So what are we to do? Well, if you can't bring grandma to the laser, you bring the laser to grandma. 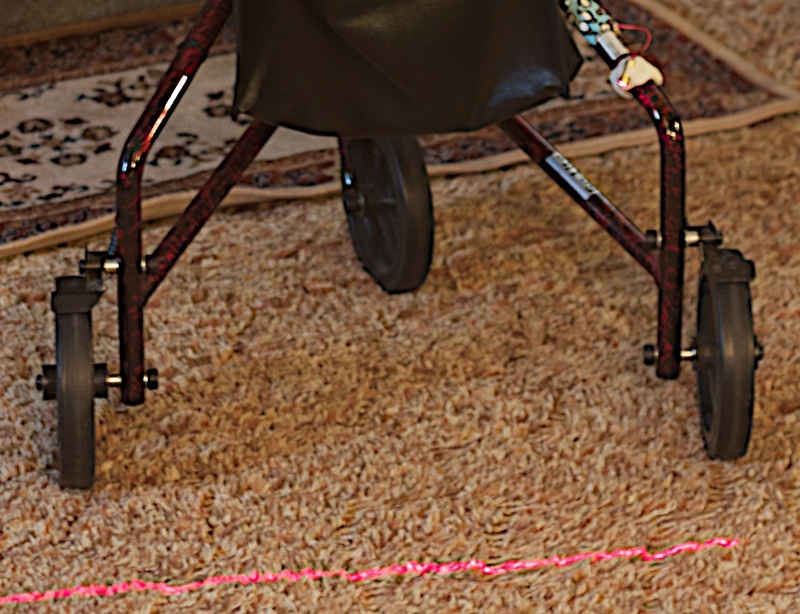 I took on the project to retrofit laser-line projectors onto all of her existing walkers. It was a surprisingly easy and surprisingly cheap project. Should someone want to reproduce this, I've collected the items here. Of course buying it through our links helps support this blog and justify the time we spend on it to our spouses. 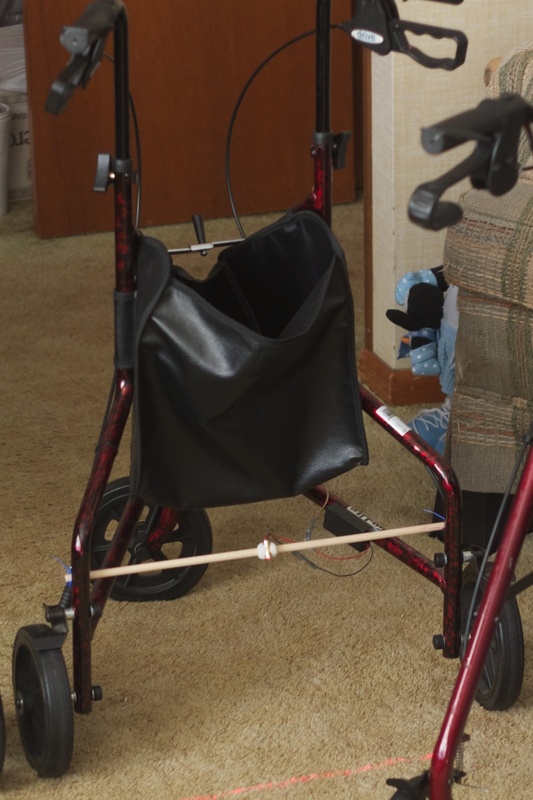 No two of Mom's walkers are exactly the same so mounting required some custom hardware. That's where the Instamold came in. This polymer has the nice quality that if you put it in hot water, it goes translucent and softens to the consistency of silly-putty. You have a few minutes to shape it before it cools, turns white, and becomes very hard and stiff. Here are a few examples of the brackets I created. I found the best results if I glombed the soft Instamold around the bar and around the laser module, trying to go about 2/3 of the way around both cylinders. As it cools it reaches a point where will hold its shape if you take it off, but it is still somewhat malleable. I had the best results if I pulled it off at that point, and then pinched the "C's" closed just a bit. Once it was fully hard, I could force it back onto the bar (and force the module back into its slot) and it would be tight enough to hold it in place by friction alone. It helps that if I don't get it quite right, I can just drop it back in hot water for a few minutes and try again. I love this stuff! Alignment was not nearly as critical as I'd feared. Getting it aligned on the right-left axis is meaningless, since the laser is making a long right-left line. If the line extends an inch or two further in one direction than another, that hardly matters. Since all but one of the my mounting points was a round bar, it's possible to rotate the bracket to move the laser line forward and backward. The module has a slot in the front that makes it easy to rotate it quarter or other flat object, should the line not be perfectly perpendicular. The only tricky bit was the three-wheeler. I started with the laser mounted on a dowel running between the two sides. That would have worked perfectly, except I then realized this was Mom's "going out" walker, and the two sides need to be able to collapse in for packing. Fortunately, nothing says the laser has to be shining straight down to make the line. Instead, I made an angled bracket to hold the laser to one of the side rails. Because I'm a belt and suspenders kind of guy, Most of the bespoke brackets are held in place with a strip of duct tape so they won't gradually creep over time. The duct tape also came in handy to run the wire and cover the switches. 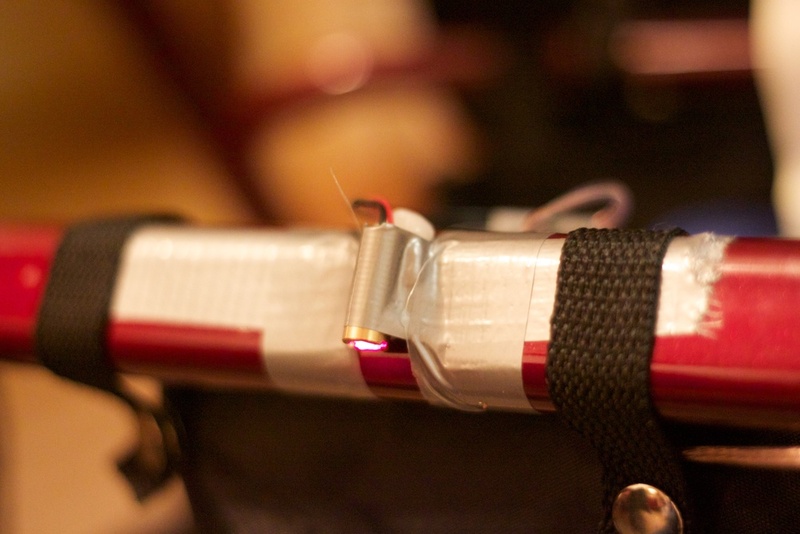 Cable ties provide must of the strength holding the switches, but the tape helps protect them from sliding as well. It also covers my soldering job and any sharp edges. While visiting Mom in the hospital, I saw that they'd provided her with a loaner walker for her stay. This made me realize that I needed a more generalizable design. Here is what I came up with. The case is thanks to Trader Joe's Dark Chocolate Mints. An Altoids tin would be just about ideal if you can get a button that doesn't extend so far into the tin (as mine does). I certainly could have used a smaller button, but I wanted to keep it big and friendly. It took a couple iterations to come up with a mounting technique that I trusted, and could be made with what was available. What I eventually opted for was a pair of velcro cable ties, attached to the back with plastic cable ties. The "loop" section of one was cut off since it only got in the way. Having the assembly rotate around the bar was still a concern, as the velcro doesn't provide a lot of traction. 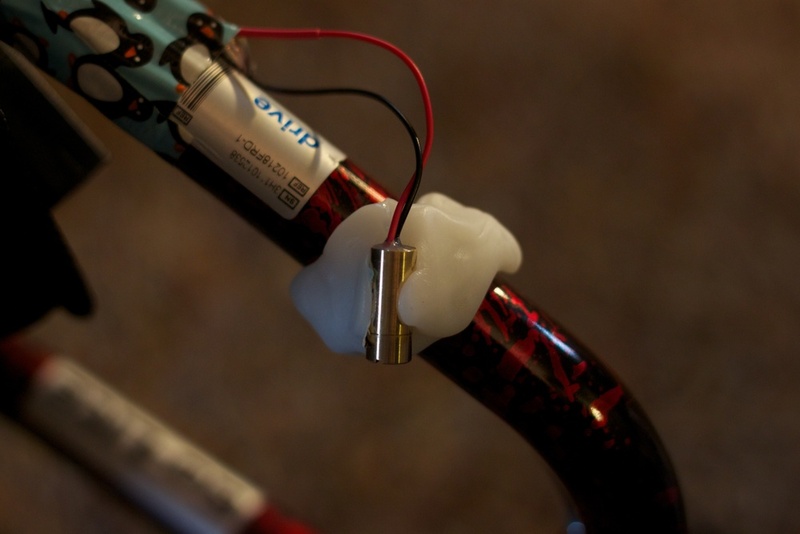 I found that adding a few beads of silicone sealant added the traction I wanted. You might also notice a strip of mounting tape on the bottom of the tin. The backing hasn't been removed, and there are a couple beads of silicone on it as well. My thought was that the foam mounting tape would help the base conform to the pipe a bit and so help the friction. In the event that the module still tends to slip, Mom could always take the backing off and take advantage of the adhesive. So that's partly how I spend my week. I know the target audience for this sort of thing is pretty small, but I now know from experience that it can really help. I was surprised at how quickly it came together. The soldering was minimal, and Instamold means making custom brackets is trivial. It's far from an ideal solution, of course. My ideal wouldn't need a switch, for one thing. Perhaps just a capacitive sensor to detect hands on the handle. It would also be nice if it could self-align. Perhaps a camera that could recognize the position of the users feet and constantly reposition the line to be just ahead. If anyone has ideas about the best way to do this, I'd love to hear about them.